This article appeared in the July 2018 edition of Golf Malaysia. Of the four Major championships on the golfing calendar, looking back into history is a popular pastime and given there have been 146 of them to savour, the selection of memories is greatest at The Open Championship. Jordan Spieth will defend the Claret Jug at the 147th Open at the Carnoustie links, which last hosted the Championship in 2007 when Ireland’s Padraig Harrington won the first of consecutive Opens in a playoff over Sergio Garcia. Harrington’s title defence 10 years ago was sealed when an imperious five-wood came to rest just a handful of feet from the hole at the 17th, the ensuing eagle placing the final nail in the coffin of the sentimental bid by Australian Greg Norman for a third Open title. The-then 53-year old, very much the part-timer at this point in his career, had wowed the golfing world with his play and took the lead into the final nine holes only to succumb to the buffeting conditions and the brilliance of Harrington’s play. As he sits down to watch the 2018 Open, Norman may rue what could have been had Carnoustie not been missing from the rota for the peak years of his career. The gap between the 1975 (Norman debuted in 1977) and 1999 stagings robbed one of the greatest drivers of the ball in history the prospect of adding to his Claret Jug haul at the links ranked the toughest test on the rota. It’s now been 20 years since Norman recorded his last four-round tournament victory, ironically in his own event - the Greg Norman International – at The Australian Golf Club in Sydney, where Norman shot 18-under to eclipse a heroic final hole challenge by Jose Maria Olazabal. Tournament appearances thereafter started to become more and more spasmodic as business, family and perhaps waning desire impacted his willingness to put his body through the work he deemed necessary to perform at the highest level. Unlike others of Norman’s generation, the Champions Tour failed to provide significant motivation when Norman turned 50 in February 2005. While he did play sporadically, Norman contested just 13 Senior events, the last of which was in 2012. It’s safe to say that cue is well and truly in the rack. When Norman decided that millions of balls on from those days on the range at Royal Queensland under the watchful eye of mentor Charlie Earp, staying thousands of nights away from home and logging countless air miles that he was going to walk, he walked. Other than the odd appearance at unofficial team events, he harbours absolutely no regrets about that decision. 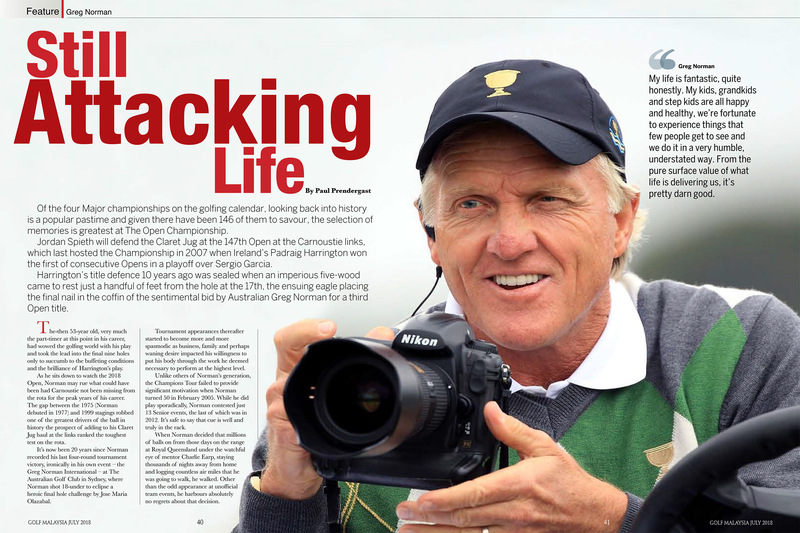 Of the many principles and values that Greg Norman documents in his 2006 autobiography Greg Norman - The Way of the ‘Shark’, it’s perhaps the final listing: ‘Attack Life’ that best depicts the on and off course persona of Norman throughout the years. It’s a mantra Norman has lived out in full from teenage years surfing and diving, an aggressive approach to his golf that took him to two Majors, 91 professional victories and 331 weeks atop the world rankings, to well-documented off course pursuits that included fleets of fast cars, private jets, luxury yachts, 12,000 acre Colorado ranches and the unflagging energy he has tipped into creating a diverse and enduring business empire. Keeping up with the Shark, even at age 63, is still as challenging as it’s ever been. I spoke to Norman recently after wife Kirsten (‘Kiki’) and he had landed in Cabo del Sol, Mexico, to oversee yet another golf course/real estate development bearing his name and brand. Much to Norman’s delight, Kiki now works cheek and jowl alongside her husband handling the interior design for all Greg Norman-branded real estate. The couple were only days removed from what Norman called a ‘very educational and informative’ vacation to Israel, Norman’s first visit to that country, which is hard enough in itself to believe given the rampant, globetrotting life he’s led since bursting on to the scene in the 70s. “My life is fantastic, quite honestly. My kids, grandkids and step kids are all happy and healthy, we’re fortunate to experience things that few people get to see and we do it in a very humble, understated way,” Norman said. Norman established ‘Great White Shark Enterprises’ while still an active player, dabbling in apparel, course design, real estate development, restaurants and wine amongst many business projects that caught his eye, or were presented to him. Along the way, he sought the counsel of many within the game, Jack Nicklaus and Arnold Palmer among them, and successful entrepreneurs and business executives as he shaped his own business acumen, skills and identity. Norman has long espoused the importance of ‘finding a niche and filling it’ and the recently re-branded ‘Greg Norman Company’ have added a variety of interests to their repertoire - eyewear, data analytics and even Cable Wake Board Parks in collaboration with son, Greg Norman Jr.
“Opportunities find me too,” Norman added, “I watch, I listen and I’ve been very lucky to identify virgin space, identify the potential opportunities in that space and map out a business plan or game plan to go after it. Norman’s course design business endures as perhaps the most tangible evidence of his enormous impact and enduring legacy in the game. He may be better known to millennials as ‘the Wine Guy’ or the guy that wrestled a chainsaw and survived, but a course design business that he was reluctant to pursue while playing - ‘I felt golf course design would be an unnecessary distraction’ - continues to flourish into its third decade. The recently announced KN Golf Links, Cam Ranh, project will be Norman’s third course in Vietnam and his 104th creation in 34 countries world-wide. Ask the Greg Norman of today - a grandfather of two with another eagerly awaited in July, a step-dad, a husband, a father - what his next five to 10-year plan might entail and you get, for the first time, a real sense that he’s almost as hell bent on taking a foot off the pedal moving forward as he was on slamming it flat to the floor in years past. Central to that ambition is positioning his business to the point where he is comfortable abdicating responsibility to his people to get on with it. “Am I (still) involved in the minutia of things? Probably not on a lot of things, but I am involved in the minutia of where I want my company to go. Be that with data analytics, telematics, through real estate or connectivity for golfers through golf carts, yes, I’m very much hands on. “I’m starting to get my company and the people within it in the right vein of where I want them to be. That’s going to allow me to step back a little. It’s (my company) my Holy Grail. I’ve nurtured it, I’ve protected it, I’ve built it, I’ve built my brand and reputation to a very solid level globally. “When I get the right people around me and a few more, which I’m starting to do now, I can sit back a little more and become more of a Chairman Emeritus than anything else. “I couldn’t have seen this happening a few years ago because it was a sports marketing company and I was the widget, I had to go do everything. Nowadays, I have trust in other people I can send to New York for meetings instead of me. My flight hours are the lowest they’ve ever been since I’ve had a plane. I’ve gone from 600 hours to under 200 hours a year and that’s exactly what I want. Don’t look now, but Greg Norman’s Attack on Life might be starting to be approached a little more regularly from the slow lane than we’ve become accustomed to. This article, courtesy of Paul Prendergast, appeared in the July 2018 edition of Golf Malaysia.